As soon as this video went viral earlier this week, it was clear it would only be a matter of time before it was picked up by tabloid newspapers, with an equally inevitable and predictable framing of the incident. That is to say, the standard ‘who is to blame’ format. Naturally, this involves inviting readers to pass judgement on one of the parties involved, which in practice amounts to a two minutes hate on the people cycling. Now clearly mistakes are made by the people in the video. It isn’t sensible to position yourself here. It isn’t sensible to maintain that position, right in front of the HGV, through the junction. It certainly isn’t sensible to drive such a large vehicle assuming that there isn’t anyone in that kind of position. But this is all very banal. Focusing on the personal failings of the people in the video means spectacularly missing the point. Minor mistakes should not result in the scene shown in the photograph above – a person very close to death, or at the very least serious injury. I don’t think either the man cycling, or the man behind the wheel of the HGV, are ‘to blame’ here, in any meaningful sense. The driver in the cab is clearly having to deal with motor traffic on his right hand side, as the two queuing lanes going ahead merge on the far side of the junction. Meanwhile, the (well-known) dreadfully limited direct visibility from the driver’s position means it is far too easy for him to fail to spot multiple human beings immediately in front of his vehicle. There isn’t even a mirror that would have revealed them indirectly. The driver literally had no idea the man was there until the collision occurred. Meanwhile the man on the bike clearly makes what, in hindsight, is a bad decision. But it’s a bad decisions that is actively encouraged by the way we paint our roads. We put painted lanes by the kerb on the run up to junctions. We paint Advanced Stop Lines in front of HGVs. It’s entirely natural, therefore, to expect human beings to cycle up to the front of a junction, both because that’s instinctive, and also because the way we paint roads promotes this kind of behaviour. Now it turns out that this junction didn’t have an Advanced Stop Line. But how are you supposed to know that when you are approaching it? By the time you arrive at the junction, it is too late, and you, and several other people, are effectively trapped in an extremely dangerous position, with the best option probably being to bail out onto the pavement, or to jump the lights. Is that really something we can expect people to do? It seems to me to be as unlikely as expecting HGV drivers to never fail to spot human beings in close proximity to their vehicles. We have a dangerous situation, created by design. So who is actually ‘to blame’ here? It’s not the individuals – it’s the system. A system that thinks it’s acceptable to mix human beings and enormous vehicles with very limited visibility, and hopes that nobody makes a minor mistake. There simply isn’t any excuse for designing roads that create situations like the one in the photograph above. Those people should be separated from that HGV entirely at this kind of junction. If that isn’t possible, then HGVs of this scale simply shouldn’t be permitted to use that junction. We have graphic evidence of just how dangerous it is to combine human beings and HGVs in that space. So we know what the solutions are. Every time an incident like this happens and we blame the individuals concerned for making mistakes, rather than the system that means those mistakes are inevitable and lethal, we will fail to prevent incidents like this from happening again. It has to stop. I ride this junction daily and there can be one very simple solution. The approach to this junction is a single lane (Cheyne Walk), and the road after (Chelsea Embankment) is also, technically, a single if very wide lane. However, just before the lights it suddenly opens up to two lanes before it then merges back to one. Solution? Eliminate the second (straight on) lane at that junction and make it a cyclists filter lane. It’s very rare that any motorised vehicle turns left at that junction in the morning rush hour, but if they did then at least they wouldn’t have so many cyclists to sit behind. Sorry, driver not looking where he’s going clearly trumps questionable road markings. It’s not acceptable to squish people, regardless of some paint. I cycle through here every day and walk here regularly too. What is particularly galling is that TfL (I think) just spent six weeks (and presumably pots of cash) ‘upgrading’ this junction and didn’t even bother putting in pedestrian lights, let alone anything else that might have made it safer for all to use. They did put in a part-time no right turn onto Battersea Bridge which drivers regularly disregard. A slip road exit for cyclist like the one coming west after Chelsea Bridge could help, perhaps? Filtering up on the side of potentially turning vehicles and proceeding straight in a left turn only lane is really risky behavior. Unpredictable traffic behavior – “everybody does it” is a stupid excuse & until you get in a lorry & see what blind spots are you should not expect everyone around you to be able to see your stupidity. If you can’t drive in traffic you probably can’t properly use a ‘cyclotrap’ either, so use a stationary bike in front of a TV. Alternatively, why are vehicles with such dangerous blindspots allowed on the roads? It really shouldn’t have been a surprise to the lorry driver that there was a cyclist there – there were lots more which he would (I hope) have seen. It clearly isn’t unpredictable if “everybody does it”. To use your argument, until you get on a bike and see how road designs encourage the cycling we see on this video, stick to driving a virtual car on your Xbox. I suggest you actually read the blog post above – it makes the point that in more enlightened countries, the roads are designed to avoid conflict between road users who are all (lorry drivers and cyclists, as this video shows) capable of making mistakes and don’t deserve to die because of it nor be imprisoned for causing death by driving without due care (or whatever offence it would have been). Blind spot mirrors are compulsory for lorries in London, particularly for those blindspots where pedestrians and cyclists are likely to be. But yes, even that is an interim or rather parallel step, much like Direct Vision whilst we get the infrastructure in place to avoid these combinations. And I thought that mirror was missing but as per twitter thread – it isn’t. https://twitter.com/hllnS/status/883045538593214464 It’s just as massively ineffective as we’d suspect. Hey ho. I’m not going to pretend to know all the details of this, but isn’t that one below the main mirror the class IV “wide angle rear view mirror”? The class V “side close proximity mirror” is a different one and I can’t see it in the photo to which you link. I hope this article is a joke, the lane the bikers were in was clearly a left turn only lane. Therefore instantly making it their fault. If you want to be a cyclist on the road you still have to abide by the laws of the road. If this was a car in the left turn only lane and went straight instead who’s fault would it be? Obviously the car driver. So what’s the difference? Just cause they are cyclists it makes it alright to ignore the clearly obvious makings on the road? You’ll have to explain to us how, without any road signage before the left filter arrow, that suddenly appears a few metres from the junction, any road user is supposed to know there’s a left filter, and given that overtaking on both sides is something 2-wheelers can do and that most similar junctions in London have ASLs, at what point they fail to abide by the laws of the road. The fault, as Mark says, is with the road design. Similarly what are the chances that none of those cyclists had ever been through that intersection before and didn’t know it was an exclusive left turn lane? Slim to none, the result is predictable and the cyclists are trying their luck. I’m unfamiliar with the UK road rules but such a manoeuvre against the indication of the lane markers is explicitly forbidden in other countries around the world. Having some form of identifying sign/signal/marking ahead of an advance stop line is an excellent idea to propose. I really don’t buy that ‘what are the chances’ argument. You seem to be saying nobody should ever cycle this route for the first time, everyone must have done it before before they do it once (conceptually impossible, of course). Road markings shouldn’t depend on people already knowing about them before they first see them! What’s the point of a sign saying ‘You shouldn’t have gone this way’? In any case, while I think finding myself beside a vehicle that size, even without seeing such a turn arrow, would _probably_ have had me decide to get off and walk on the pavement, the whole thing just illustrates why cycling in London is not appealing to most normal people. Who wants to have to constantly negotiate situations like this, with possible violent death as the penalty for being insufficiently skilled? The cyclists got it wrong, but its the road design and lack of safe routes that put people into these situations. Watch the video, a few cyclists are able to make it out in front of the truck and take the lane. So even if a few cyclists are completely unaware of the junction layout and then choose to push out in front of the truck its not a disaster. But the video is a large group (of likely unrelated cyclists) who have chosen to try and get past the truck instead of slowing up and merging back into the traffic. I’d suggest that its actually selfish cyclists who know exactly whats ahead but do it anyway hoping that there wont be too many others to get in their way so they can get out first and take the lane. Even an ASL painted here would have been filled beyond capacity. Its not like there was a bicycle lane taking them up and into that position, before passing the articulated truck its possible to see that there is no space ahead of it in the junction and the safe option is to queue in the stopped traffic. The difference is if were a car driver they wouldn’t be killed as a consequence of the error. Which is why people feel safer driving a car than riding a bike. Separate cycle lanes are great but in reality they can never take us everywhere, so we need to share the roads. I HATE not knowing if there’s an ASL when I approach a junction, not knowing whether it’s OK to filter to the front or if I should queue in the fumes. EVERY junction should have an ASL. I don’t know of any place (including in the Netherlands) that has separated cycle lanes everywhere to the extent that as a cyclist, you would never need to share the road with other users. But more importantly, such a system isn’t necessary anyway. However, it is very beneficial to have these cycle lanes on the busier roads with a high volume of cars and/or higher speed limits, especially arterial ones. Completely this. As others have said, its (at the least) very annoying to filter up to the lights along a queue of stationary traffic only to find at the head of the queue there isn’t actually an ASL. I very much agree with this – as I put it “small errors should not have large consequences”. The thing I always think of here is the television series “Aircrash Investigation” (“Mayday” in the US). In several cases the outcome will be that a mistake by or weakness of the pilot is to blame. But that’s not the end of the story. If there is a pilot error, it will usually still lead to changes – changes that either stop the error from being made or stop it from risking losing the plane. I think that should be the attitude on our roads too: an accident or crash is not a fault to be blamed, but a problem to be solved. And that solution will usually be in road design. Of course there are some cases where someone does something so egregious that one could not, and perhaps should not foresee it – if a drunk person drives their car with 60 mi/h through a pedestrian area, it’s all his fault. But in cases like this, where mistakes have been made, but they are small and easy to make, the first question should be “what can we do to stop this from happening again”. Enforcing extra mirrors could be part of the answer, but really, as you write, on crossings such as these bicycles and trucks should not be in such close proximity. There are comments about how were the riders meant to know the road layout before they got to the junction? That may be a fair question of they were out for a club ride. But, if you’re cycling in central London, I guess you’re commuting and probably along the same road every day. They appear to take a calculator risk by moving along the artic’s LHS and cross the white line in advance of a green light. This is an offence under RTA. Highway code clearly states you must not cross solid white line in advance of light change. London Rules don’t apply in any known situation. Can you imagine what would happen if a lead rider came out of his clips, threw a chain or missed a gear? I think the lorry driver was understandably furious. He knew how close it had been to a fatal accident and one that was not of his making. I really think the mere presence of a vehicle that size next to me would have made me decide to transform into a pedestrian. But ‘not crossing the white line in advance of a light change’ seems irrelevant. Firstly that rule is ignored more often than it is followed by motorists (regularly stopping in the ASL or completely blocking a ped crossing, as I very frequently find when crossing roads as a pedestrian), and secondly as far as I can make out, the cyclist who gets into trouble is _not_ one of the ones who jumped that line. Indeed the ones who did so avoid the problem! I spotted that as well. I’ve sometimes been sceptical about the claim that it is safer to jump a red than to wait until the light turns green, but this is a pretty good example of how it can be safer. Actually all this is an argument for having Direct Vision HGVs as standard. There will be plenty of locations where cyclists and HGVs can’t or won’t be separated. So either the cyclist has to get t right EVERY time – which none of us can be expected to do – or you have to have HGVs where the driver can see what/who is near them. The main point missed out on is that about twice as many pedestrians as cyclists are killed yearly in London in collisions with HGVs – again “blind spot” is frequently given as the cause. So let’s engineer the vehicle as well as the environment, for pedestrians and cyclists” sake. Even with perfect vision its a case here where the cyclists are expecting the articulated vehicle to yield while they ignore the road markings. The person cycling with the camera forces themselves into sharing the lane with the HGV leaving the truck driver with no options. Would that truck driver have passed a cyclist in that lane and tried sharing the space? Do they think its wide enough? The cyclists have taken the truck driver out of the decision making. In examples in the video its easy to say the truck should have simply stopped, but then how many cyclists should it let pass by before its allowed to proceed? What if the cyclists keep coming? I think we should all agree that right of way should be unambiguous so that there aren’t situations like this that are open to radically different interpretations putting vehicles into conflict. If you’ve accidentally made your way down an exclusive left turn lane in a car is it ok to just pull back into the adjacent lane without giving way? what about if you were driving an articulated truck? In the absence of cycling infrastructure directing the cyclists into that position they’re entirely responsible for the choices they make. All of them. If more ‘kept coming’; still all of them. Literally forever if necessary—in practice, calling for a banksman if it goes on for more than a few minutes. Only a sociopath would think it’s acceptable to do otherwise. 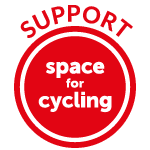 Surely we do all agree that it’s best to engineer out the conflict in the first place, but it must also be recognised that the road haulage lobby is one of the loudest and most influential objectors to pretty much any protected cycling infrastructure. At least in UK. In my experience, too many HGV operators will start to pull in from an overtake the second the cab passes my front wheel, the better to put me under their trailer’s rear wheels. So a good many of them will try to ‘share the space’ I’m about to occupy and expect me to take evasive action. Perhaps we could do a bit of Exchanging Places and see how they like me doing it to them? –An immediate guide for cyclists (and pedestrians) and for drivers when they do find themselves in these “pinch point” situations. Inevitably the “immediate guide” will mostly apply to cyclists. This is not because they are mostly at fault and certainly not that they bear the greater responsibility, but simply that they* are more aware (through having unimpeded visibility and hearing as well as generally greater sense of being at risk) than the lorry driver in their cab. And it will apply all over, similar junctions where cyclists are led into risky situations are very widespread. Yet again petrolhead proceeds to comment without reading the article. Proceeding without looking is the motorist’s way, isn’t it? Vehicular cycling by any chance?. Yawn. Doesn’t work.